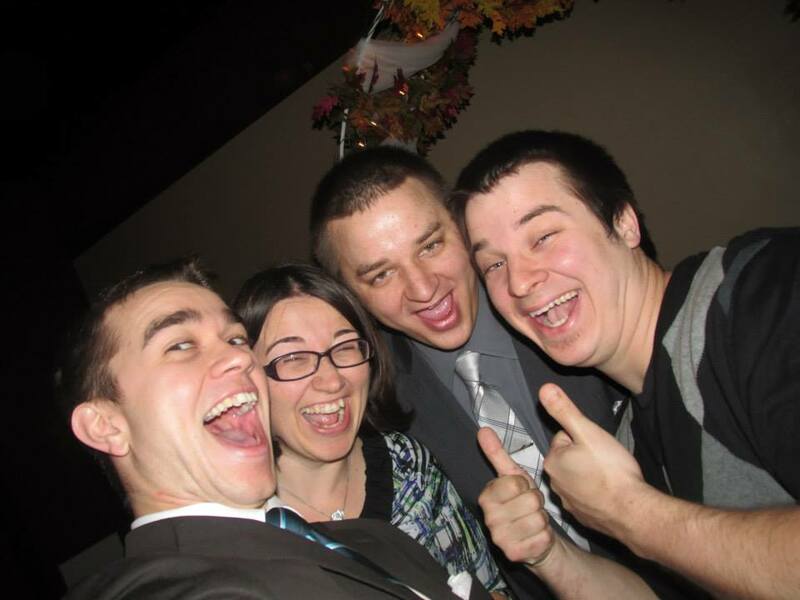 This is a recent picture that was taken at a wedding of me and a few of my brothers. This picture makes me laugh out loud every single time that I look at it. It is a great picture. It represents a moment captured in digital form of a few siblings goofing around during some down time on a random weekend. The effort it took to pose this picture was all of about three seconds. There is no professional photographer involved. We were not trying to make this picture happen. The photograph is purely a by-product of our silliness. There just happened to be a camera there at the time. It represents the joy that we have in our relationships with each other. You can not force things like this to happen, even if you try really hard. The key that I have been dwelling on is that the picture did not make the joy, the joy was already there. We did not create the joy either. It seemed to blossom on its own from the relationships that we have as siblings. This really has me pondering this morning. Joy can not be forced. Well that is odd. Apparently I have not dedicated time purely towards the search or production or maintenance of joy directly. Yet, as I think back over the past year I know that I have experienced joy in such rich and beautiful ways. Still pondering these things in my heart, I turned to my Bible to look up some verses about joy. The prospect of the righteous is joy. The prospect is something that is awaited or expected. Joy is what is awaited or expected of the righteous. So what else does the Bible say? God fills us with joy and peace. It is something that God gives. I never ceased to be amazed and in awe of how one theme can be reiterated many times over throughout the Bible. Joy is found in the Holy Spirit. Joy is a fruit of the Spirit. It comes from the Spirit. It just makes me smile to think of how little I understand the fruit of the Spirit. I can easily get caught up in thinking that it is my job to create these things in my life. That is like me thinking I am going to plant an apple seed in my yard and grow an apple. If I plant an apple seed the natural outcome will be an apple tree. The fruit will come from the tree. Perhaps if I take good care of the tree and tend to it, it will create a better opportunity for fruit to grow, but still at the end of the day I can not grow the fruit itself. Just like I can not grow, make or create joy on my own. In this verses the joy and encouragement comes from “Your Love”. This verses mentions joy being made complete through a visit and a conversation face to face. Joy can not be forced. It is not a task for the to do list. Just like my picture today, it is a by product of something else that was already taking place. With my brothers, the picture and the joy grows out of our relationship, our love for each other and of being together. The joy that God gives us will grow out of our relationship with Him, the love He has for us, the love we have for Him and our connection to the Holy Spirit. Thank You so much for the lesson on joy this morning. Please help us to be encouraged and filled with joy as a product of the relationships that we have in our lives. Please help us to not become weary in attempting to force joy to happen, but help us to instead place our focus on the relationships with You and others that can create environments for joy to blossom from. God, it is just amazing how time and time again You so generously pour out these good things to us. We do not deserve them in small quantities and You just lavish us with them in abundance. You are so marvelous! Thank you so much for the joy. May we praise You for this awesome gift. In Jesus’ Blessed name, amen.